were delighted to host our 2018 joint reunion! For those that joined us in New Orleans, Louisiana, THANK YOU! Visit our PHOTO ALBUMS from the HK Mardi Gras reunion! 2015 was the year of Celebration! And for the Surprise visitors! April 29-30 and May 1, 2016 – In England! After nearly 20 years, Noel and Lisa are handing over the Harmony Kingdom reins to the one person who has their complete trust and admiration — Peter Calvesbert. Back in 1990, Peter and Martin started what would become a booming box figurine craze. When they became acquainted with them in 1994, it was Peter's extraordinary talent that inspired them to create Harmony Kingdom. And over two decades, Peter has never once let them down. They will very much miss working with him, but they know that he, and his wife Andrea, will steward the collection with the utmost care and creativity, and they so look forward to seeing the interesting directions they take. The Harmony Kingdom UK website is live at www.HarmonyKingdom-UK.com. Harmony Ball Company will maintain www.HarmonyKingdom.com as an archive site. Harmony Kingdom's authorized independent clubs aren't secret societies, but they are a source of great pleasure and sometimes even ecstasy for fans of Harmony Kingdom. Each club is organized and run by individual collectors and, as such, are all unique. 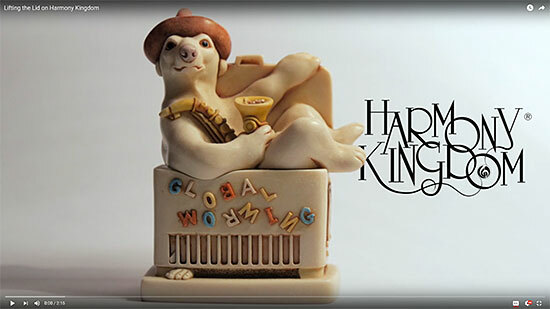 Yet they do have one thing in common—members are all fascinated by Harmony Kingdom box figurines and enjoy discovering their hidden secrets. In addition to a shared interest in Harmony Kingdom, the clubs are deeply involved in charitable activities and many provide informative newsletters and organize fun social events. 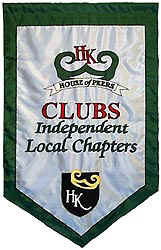 Each authorized independent club elects a delegate to the House of Peers—the central council that acts as liaison between the independent clubs and Harmony Kingdom. Please check the listing for the [club nearest you]. Many clubs accept members from out-of-state and offer long-distance benefits. Or you may decide to form your own independent club. Guidelines for receiving official sanctioning from Harmony Kingdom are listed under [Independent Club Guidelines]. Harmony Kingdom's authorized independent clubs are a great way to meet like-minded folks, develop friendship participate in meaningful charitable activities, receive special offers, invitations and pieces, and have some fun. Join today!